In the beginning of the year 2008, when proposed to go on a non-stop three day journey in the Russian trans-siberian to the total solar eclipse area, located in Siberia, Agnes Meyer-Brandis didn´t hesitate for long before accepting the challenge. To realize that all these are one woman projects makes one feel in awe. Before that journey and accomplishing The Moon Goose Experiment in Russia, she set up the Iceberg-Probe installation in the Dachstein glaciar, in the Austrian Alps, continued her work as the official Cologne metro construction site photographer, followed her research paths in Brasil and gave lectures in several universities in Germany and Switzerland. Would she have been able to realize succesfully all on-going projects and carry out the new ambitious and complex project plan 6000 kilometres away from Cologne, with a tight deadline that could not be delayed, and an almost non-existing budget nor production crew in Russia, where she didn´t know anybody and was not even able to read signs? This is the feature of tenacious and disciplined Agnes Meyer-Brandis way of working. For anybody else this proposal might have appeared as utopia, but for Agnes it came as a challenge and a possibility to try out and practice her own version of English bishop Francis Godwin´s theory, (author of the book " The Man in the Moon" 1638). The book describes the behaviour of the Moon Goose, which instead of migrating to the south, flies to the moon in the autumn. Would the Moon Geese head to the moon also during the total solar eclipse? 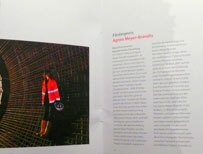 For many years the artistic work of Agnes Meyer-Brandis, the founder and director of Research Raft for Subterranean Reefology (FFUR) has explored deep in the dark zone above the earth and ice. However, in the 2007 the Cloud Core Scanner -project took her to the other extreme, to the skies. The artist was accepted to carry out a multidisciplinary art project during three scientific weightlessness flights of the German Space Agency. Enormous efforts were needed to carry out this daring enterprise and be able to manage something that many experienced scientists just dream about during life lasting careers. 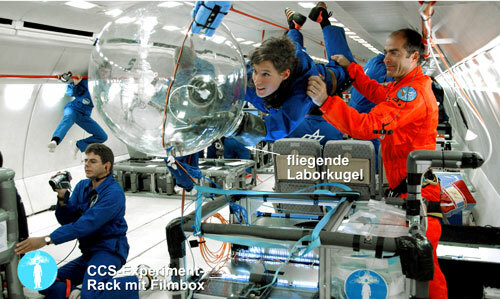 In the images taken during the Cloud Core Scanner Experiment flights, the science -fiction movie star like artist can be seen floating wearing a blue overall in a flight capsule while researching the activities of aerosols under the condition of zero-gravity. The shift from the subterranean world of elfs and fairies has taken Agnes Meyer-Brandis to the clouds, among migration birds, planets and heavenly bodies. She doesn´t let the geographical or cultural obstacles, nor the physical laws set limits to her artistic views and aspirations when exploring the area between fantasy and science - we may just wait to see if her future works will develop in outer space - and, what might be her next dimension?